I made some really easy sides the other day for Christmas dinner. Now, these won't be winning any awards for the "from-scratchiest-bestest-hardest-ever" category, but if you've only got 30 minutes and you need something to bring to a dinner party, they are delicious. I went right for the canned yams with this one. My mom does it from sweet potatoes proper, but I'm just not at that level right now. Mash the yams and melted butter together in a big bowl. Add the sugar and spices, and 1/2 cup of marshmallows. Spread the remaining marshmallows on top. 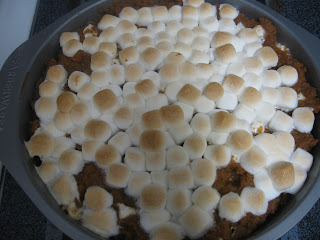 Bake for 20 minutes at 350, or until the top marshmallows are golden brown and puffy. 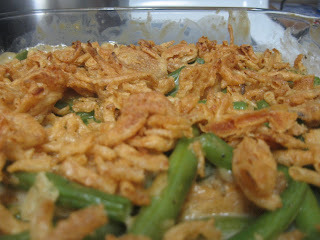 I used real green beans for this, but I'm sure you could use canned. cup of French fried onions. Mix green beans, milk and cream of mushroom soup in a big bowl. Add 1/2 cup onions and spices and stir well. Pour into 8x8 casserole dish and spread the remaining onions on top. بزرگترين توليد کننده انواع تابلوهاي چلنيوم ، پلکسی گلاس ، قيمت تابلو فلکسی ، استيل ، برجسته ، تابلو ال ای دی ، نماي کامپوزيت و ترموود با بهترين کيفيت و نازلترين قيمت در اسرع وقت در خدمت شما مشتريان گرامي مي باشد.